We at Eco Tree Care & Conservation Ltd have a passion for apples and orchards, we have been involved with many new Orchard Plantings as well as restoration of old orchards. We are involved with local orchards and orchard groups and we took part in the increasingly popular apple days held across the country in the autumn. A successful new orchard requires careful planning, and ideally the process should be started months before the winter planting season. Some varieties, particularly the more unusual, may have to be grafted to order, these will need ordering a year in advance. 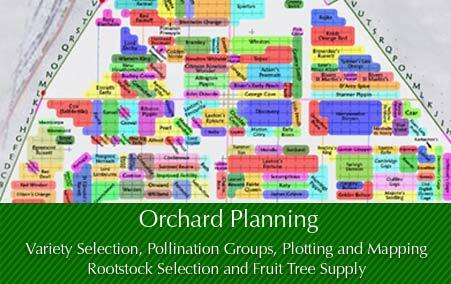 There are many factors to consider when planning and planting an orchard, below are some of the most important points that our experience and expertise can help to ensure are properly considered and correct decisions made at the planning stage. 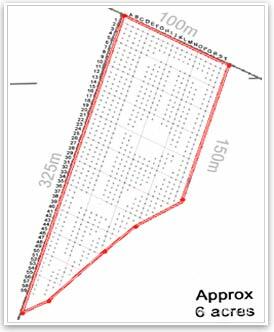 Soil type and topography - Is the area for the proposed orchard suitable? A knowledge of the soil type and the site conditions throughout the year is important to decide if even a site is suitable for planting an orchard. Some dwarfing rootstocks require good soil for the trees to thrive. Waterlogged or boggy areas also will not be suitable for a new orchard. The grasses and other ground cover can give a good indication of the underlying conditions of the soil. The lay of the land will have a bearing on whether a potential orchard site is suitable. Fruit requires good amounts of sunlight to ripen adequately, for some varieties in particular, full sun is an imperative. A knowledge of frost pockets, or persistant shadows at certain times of the year will also be an important factor in deciding, if not whether to plant, where to plant certain types of fruit tree or particular varieties in the orchard. Early flowering varieties are particularly prone to frost damage, get the planning and positioning wrong and there may be little fruit at all. Similarly, some varieties or fruit types require a bit of shelter. Exposed positions or prevaling winds across an orchard area will have an impact on what is planted where. The end use of the orchard and the preferences of the orchard owners will decide on what the mix of the different types of fruit trees are planted. At some point and early on in the orchards planning process consideration should be given the realtive proportions of eating apples to cooking apples, and for example the number of pears, gages, damsons, plums, cherries and so on. Once the fruit types for the orchard are decided they need to be positioned within the available area, and the paths and clearings planned. 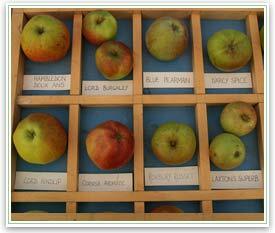 There are a great number of fruit tree varieties; there are over 2000 distinctly different apples alone in the National Fruit Collection at the Brogdale Horticultural Trust in Kent. Which ones are selected for inclusion in a new orchard will perhaps depend on personal taste preferences and commercial decisions but also guiding the final selection will be the particular varieties suitability for the climate, their susceptibility to disease, the time of year that the fruit will ripen and perhaps their storage and keeping qualities. With the help of a number of apple and orchard experts over the years we have a have compiled a comprehensive list of our 'best' fruit varieties, particularly with a view to organic orchards within a non-spray regime. 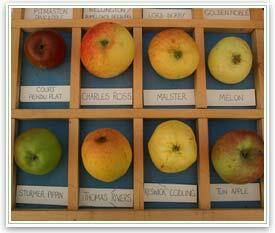 We listen carefully to what our customers are looking for and with their input select the varieties with them. We bear in mind all the other factors listed here, like pollination group, time of ripening and storage to come up with a selection that will give a good range of fruit and ease of harvesting throughout the season. As well as including the most poplar varieties we also give consideration to local varieties. Their inclusion provides historic links to the past. 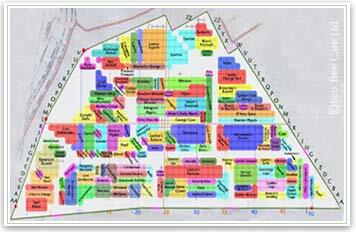 This is a map by the East of England Apples and Orchards Project (EEAOP). 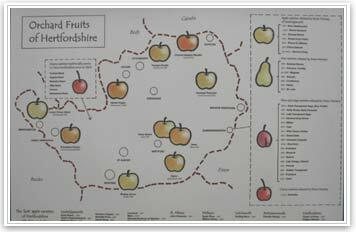 It shows the variety types and distribution of Apples, Pears, Plums and Cherries in Hertfordshire. By getting the variety selection right at the start it possible to have a progression of fruit becoming ripe as the harvest season runs into winter. Some varieties store well, so with careful planning, and good storage conditions it is possible to have fresh apples from the early ripening varieties in August through winter into stored apples until May. With other fruits in the mix that ripen in June such as Early Rivers Cherry it is possible to have fresh fruit more or less all year round. All fruit varieties are grafted onto rootstocks, the correct choice of rootstock for the size and purpose of the orchard is important. The rootstock will determine the distances that the trees are to be spaced, it will determine the look and feel of the orchard as different rootstocks will develop into different size trees. As a general rule, apple tree canopies will extend out as wide as they are high, although pear tree canopies tend to go higher than they spread out. The type of rootstock and style of intended management will determine the density of planting, and coupled with this the area available and desired number of varieties will have a bearing on the choice of rootstock. Having said this, ‘traditional’ orchards are typically planted using the MM106 or M25 rootstock. Dwarfing rootstocks are more suitable for commercial orchards, or for where space is at a premium. The MM106 and M25 rootstocks will grow into what you would normally consider to be a tree. The dwarfing rootstocks being smaller will not give the same effect, however they are high yielding for small areas and allow for a greater number of varieties to be fitted into an area. Different rootstocks will produce trees with different life expectancies and disease susceptibilities and resistancies. All these factors will have a bearing on what rootstocks are selected for the Orchard. 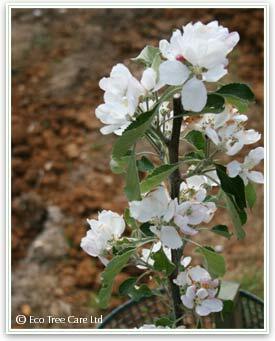 Fruit tree varieties flower at slightly different times with the trees with similar flowering times grouped together. So some thought has to be given to grouping of trees. For pollination purposes it is useful to include strategically positioned crab apple trees in an orchard. Crab apples generally have long flowering periods and so can be useful trees to provide pollination 'cover'. Apart from grouping like fruits together, dessert apples together, cooking apples together, pears together and so on, one of the most influential factors on where to position trees in large mixed orchards comes from when they ripen. It can be very very useful and efficient to have a sequential order of ripening among the fruit groups. Getting the position of trees with relation to when they ripen can make life much easier come harvest time.